Brad Bocksel is a treasure hunter, but he’s not in it for the cash. He started digging up lost artifacts — ranging from silver coins to bullets used in the Civil War — when he was in middle school, and more than two decades later he’s never sold a single one. He’s no hoarder of history either. To prove it — though it’s not as if anyone dared him — Mr. Bocksel turned over some of his most prized possessions last Wednesday to the Fraunces Tavern Museum, a building that dates to Colonial times at 54 Pearl Street in lower Manhattan and is owned and operated by the Sons of the Revolution preservation group. All 20 donated items originated from the Colonial and Revolutionary War periods. Mr. Bocksel found them on his family’s Main Road farm in Aquebogue and other places on the North Fork. “I’ve had them for so many years,” Mr. Bocksel said of his finds and why he chose to part with them. “They don’t need to be in my house. They need to be in Fraunces Tavern, where they belong. Mr. Bocksel has recovered items that date back thousands of years. Even when he isn’t out with his metal detector, he’ll somehow stumble upon items. Along the Sound beach in Mattituck, he found a stone spearhead the Southold Indian Museum estimated at over 3,000 years old. He has it framed in his house. 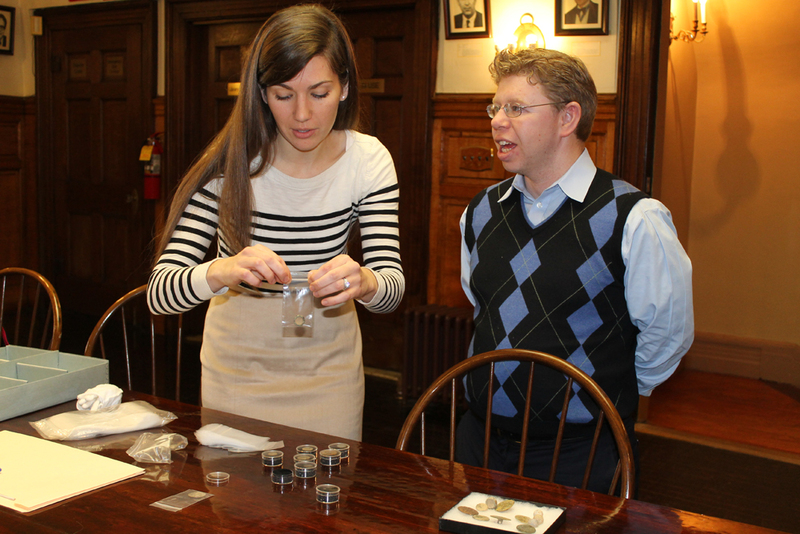 He’s found Colonial buttons and shoe buckles and bullets from the Civil War. He’s excavated crotal bells on the North Fork and in England. Such bells were used on livestock in the 18th century to help scare off crows, he says. In a video Mr. Bocksel posted to his YouTube channel under the handle “diggerbrad,” he can be seen showing off his items and even ringing one of the bells. For Mr. Bocksel, using metal detectors and digging up artifacts is just about the coolest thing anyone could do. Even more interesting for the Bocksels is that some of the items Brad has dug up over the years likely belong to his ancestors. The home on their property, called the Luther Moore House, is registered with the Riverhead Landmarks Preservation Commission and dates back to around 1865. He and his wife, Karen, bought the house from other relatives almost 10 years ago and moved to the North Fork full-time. It didn’t take long for them to realize they were sitting next to prime hunting grounds for metal detecting. Brad’s very first find in Aquebogue was a large cent coin. American large cents were in circulation from 1793 to 1857, according to CoinFacts.com, and are prized by collectors. Although Ms. Bocksel never joins the men on their treasure hunting expeditions, she said the pastime has helped them make friends all over the world. Not only do they go on trips with other hunters, there’s also an active online community where people show off their finds. Brad posts images of artifacts he’s uncovered at diggerbrad.com. And nonprofit museums such as Fraunces Tavern reap the benefits. “Fraunces Tavern Museum is thrilled to receive the donation made by hunter Brad Bocksel,” said Jessica Phillips, the museum’s director. The building dates back to the 18th century and held the departments of foreign affairs, war and treasury offices during the Revolutionary War. “It was really quite noble of Brad,” his father said.